Meet Bethany Taylor, a University of Montana graduate student in Environmental Studies. Bethany, who is pursuing the writing option within the EVST program, is one of seven U of M students working with CFWEP to lead its Milltown Dam Education Program in the Missoula area and Anaconda schools this year. Bethany and the other UM students are guided by CFWEP and also under the skillful eye of Dr. Vicki Watson. Ms. Taylor, a New Hampshire native, will be a guest Waterblogger over the next several months. We hope you enjoy her account of Carlton Nelson's class field trip from earlier this winter. Mr. Nelson's class came to the Milltown site after being the first class group to visit the BP-ARCO waste repository, or commonly known as the Opportunity Ponds. “I wonder if this is what aliens would do to us…” was one comment overheard as Mr. Carlton Nelson’s seventh graders from Anaconda’s Fred Moodry Middle School poked and prodded at macroinvertebrates on a recent CFWEP field trip to the Blackfoot and Clark Fork Rivers near Milltown Dam. The Anaconda field trip was the last one facilitated by CFWEP this fall, and it seemed to the facilitators as if the best had been saved for last—these students were across the board engaged, informed, and did a great deal to counteract the “bad rap” that middle-school students often unfairly receive. Despite chilly temperatures, the students all maintained good attitudes and demonstrated a clear understanding of the various ways one can assess river health, and why in particular, Montanans should know about the status of these two rivers. In fact, the Anaconda students have better reason to know about the health of the rivers and the clean-up than most—the Opportunity Ponds where the contaminated sediment is consolidated is pretty close to their backyards. Not that their proximity to toxic waste seemed to dampen the Anaconda students enthusiasm for studying the rivers in any way. The day before the field trip to the Blackfoot and Clark Fork Rivers in Bonner and Missoula, the students had been taken to Opportunity to see the former tailings ponds, now referred to as the BP-ARCO repository. That was deemed “pretty cool” by most of the students—with the exception of one kid who was wearing shorts that day and wasn’t allowed off the bus. “We’re the only kids who’ve gotten to see those ponds,” several students said. Active involvement seems to be the key to getting students to retain interest and absorb scientific concepts and data. 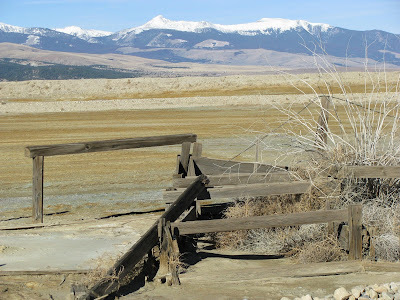 The site CFWEP uses on the Blackfoot River is on a big gravel bar. Due to recent rains and snow, then snowmelt from the mountains, the river had changed its course and come right through the gravel bar with a 15-foot wide channel. While this created some interesting logistical challenges, including a longer trek than usual from the bus to the site in the chilly morning, what was more interesting was having an active example of recent geomorphology. We spend a lot of time thinking and talking about how rivers are active ecosystems, but even comparing data collected two weeks before the Anaconda trip showed a different river. The underscored the importance of record keeping, which made perhaps a few more cold fingers wiggle out of their mittens to record data on the water chemistry, the geomorphology, the macroinvertebrates, and the riparian vegetation. The combination of these studies amounted to giving the two rivers a full physical exam, and then comparing the data to determine the health of the rivers. In general, the Anaconda students found that the two rivers were in good shape. Perhaps more importantly, the students had fun, and learned how to apply lessons from their science classes and CFWEP lectures to reality. They also got to learn new things. “The coolest thing I learned is that plants that grow along the river steal oxygen from the river at night,” said an enthusiastic Aly Bisch. She and her friends were at the water chemistry station, possibly the favorite station of the Anaconda students, although they were interested, involved, and informed at all four. If these are the entomologists, water chemists, geomorphologists and riparian ecologists of the future, the health of these rivers are in good, if heavily-mittened, hands.